Why there are less jobs for engineers? Why there are less jobs for engineers? This is the question which most of the students are asking me these days. Although I have written certain article on this topic, still I would like to discuss the topic in more detail. My recent article was about why engineers are not getting job offers? Guys what do you think why there are less jobs for ENGINEERS? Who is responsible? Education system, industry or students? Very interesting response was received from some mechanical engineers. So instead of giving my point of view on this topic, I would like to share their views on this. Pankaj Koshta: Education system is responsible for it. In maximum colleges, practical knowledge is not given to students to motivate them about the field. Sathish: We can’t teach the cutting edge tech to students in colleges. We should give maximum information (applications) about latest software and what you have to do. Internship and training must be there in their four year curriculum. Collin E Enyi: Lack of Practical Training in a Workshop., Most Schools don't have Functional Machines, (Lathe, Drilling, Boring etc). Theory alone is not helping matter. Md Azad: Education system is the main culprit otherwise top class students opt for engineering. Half educated boring teachers. They don't even know the spelling of passion and enthusiasm (they don't motivate). Number of private colleges doesn’t have good infrastructure and labs. Even if any engineer gets a job, they are forced to do the work for 12 hours instead of 8 hours. Co Joshua: Economy is responsible for less jobs for engineer. It's like a cycle. Since the rate of income in our economy is low due to corruption, professionals are forced to go abroad seeking opportunities. Instead of working in their own country, they take their attention to other countries with high salary offers, thereby the economy would decrease the reserve on tax. A phenomenon known as "Brain drain". Hisham Miind: Lesser vacancies & more engineers availability. There should be balance, and engineers should not settle for less than they deserve. Because of lesser jobs, industries are getting benefit because of giving low wages to engineers, as they can get many if one ends the job because of less salary. 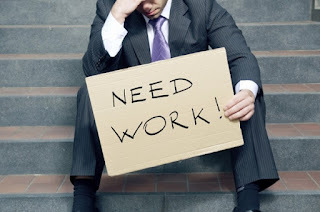 All are responsible and government should seriously solve this big problem of unemployment. Jiaul Faisal: Poor educational system, colleges should create Engineers instead of producing engineers. Nitin Gurjar: Student are responsible. Because after completing engineering, an engineer generally stands only to get a job but he never try to. Make some new thing so that number of jobs are increased. Sundar San: Why students wants job rather than creating a job? Aurel S. Cani: Education system which does not cooperates with industry. So we can learn and can be ready for every job. Without practice we are nothing. Dean Preston: Lots of jobs for engineers!! More than most career paths just not as many for graduates with no experience. I don't know a single engineer who has been out of work longer than a few months. Lokesh Tak: Every one want to be an engineer and want good job in MNC, they take only-only one option, but in this world there many options, just like- writer, lawyer, painter, musician, singer, agro industrialist, defense and many more. We need to change our view. Vivek Gupta: Well there are many reasons for less jobs for engineers. 1. Jobs in industry especially in India are mainly for diploma holders. Each and every thing in the small or medium level industry requires just diploma to control and coordinate the shop floor work. 2. The increasing number of B.tech students are compelled to do the jobs which earlier diploma students were used to. This leads to underemployment and thus the B.tech ones leave the job leading to unemployment. 3. Lack of industry and academic collaboration due to which most of the engineering students fail to meet the expectation of the industry. 4. Lack of research and development in our country. We only use labor not brain. India can give jobs to laborers but not to engineers. 5. Increasing population in engineering and compared to this jobs are fixed. 6. Lack of applied knowledge among students. Engineering is now just theoretical. Kumar Mani: Don’t know whom to blame. Corrupt education system that stands for business only. Take money - let the student study books at his own and give degree after they clear all papers? After four years I am compelled to ask myself: Am I an engineer? Or just a book worm who struggled only for a degree? Jamal Jamal: In fact many are responsible for fewer job opportunities for engineers. 1- Government 2- industry 3- education 4- bad recommendation. 1. Even government institute not doing proper work to motivate and to give practical knowledge to students. 2. If any of one starts work on any unique project there is no finacial help by government. That is true. Government is equally responsible for this bad governance. Educational system is wrong. government is giving more offers to sc,sc and for minority students..so people who doesn't have any minimum knowledge are studying engineering ...government should give equal preference for all students ...and to for poor students they hav to provide scholarships not forr...government is providing both scholarships and reservations for the people so the quality of education decreases...if u see the higher authorities are of reserved categories...because of those reservations person who is not eligible to the job is also doing the job... up to scholarship it is ok but reservations are to be avoided .. Thank you Gudivala for your analysis. It is true that merit is not being considered while offering jobs. Many talented engineers are not getting good jobs after graduation.